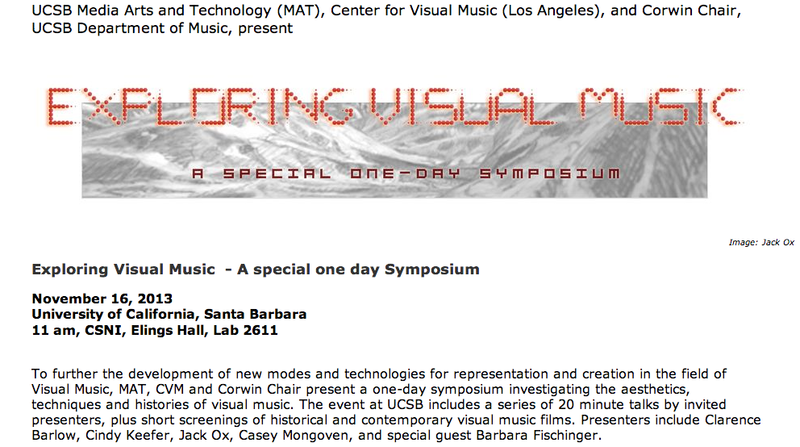 "To further the development of new modes and technologies for representation and creation in the field of Visual Music, MAT, CVM and Corwin Chair present a one-day symposium investigating the aesthetics, techniques and histories of visual music. 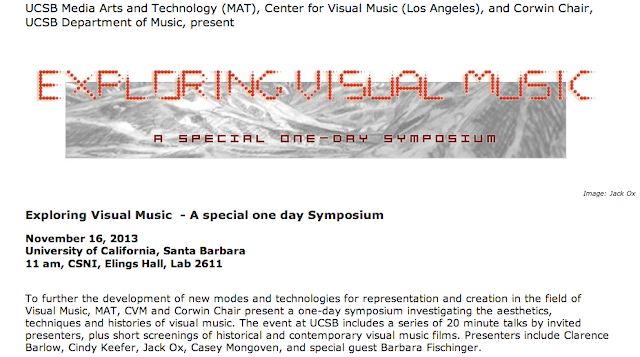 The event at UCSB includes a series of 20 minute talks by invited presenters, plus short screenings of historical and contemporary visual music films. Presenters include Clarence Barlow, Cindy Keefer, Jack Ox, Casey Mongoven, and special guest Barbara Fischinger." 11 am Welcome remarks by Clarence Barlow, UCSB; Introduction to program by Cindy Keefer, Center for Visual Music, plus 2 opening short films.